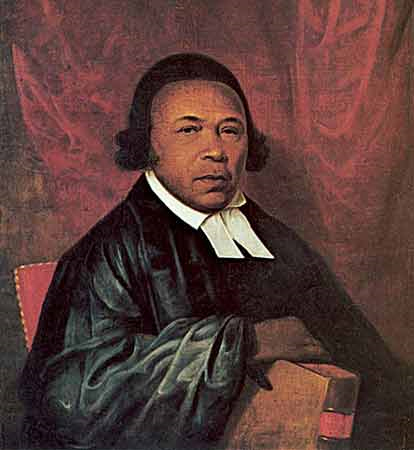 February 13, 1818 Absalom Jones, abolitionist and clergyman, died. Jones was born enslaved on November 6, 1746 in Delaware. By 1785, he had bought his and his family’s freedom. Together with Richard Allen, Jones was one of the first African Americans licensed to preach by the Methodist Church. In 1787, they founded the Free African Society, conceived as a non-denominational mutual aid society to help newly freed enslaved people in Philadelphia, Pennsylvania. In 1792, Jones founded the African Church of Philadelphia which opened its doors on July 17, 1794 as the African Episcopal Church of St. Thomas, the first black church in Philadelphia. Jones was ordained as the first African American priest in the Episcopal Church in 1804. Jones is listed on the Episcopal calendar of saints and blessed under the date of his decease.